The recent string of good news for the Meadowbrook Mall continues. In recent months, several new business – mainly national brands – have opened shop in the decades-old retail hub in the City of Bridgeport. New businesses coming in, however, hasn’t been the only good news. There have also been more than one renovation projects. And on Monday, another project became official. According to Bridgeport Community Development Director Andrea Kerr, one of the larger retail establishments at the Meadowbrook Mall is about to undergo a six-figure overhaul. Kerr said on Jan. 14, a renovation was acquired to do a substantial interior renovation for Old Navy. The permit is for $125,000. James Hunt Construction from Cincinnati, Ohio, will be the contractor on the project. They have acquired a city business license. “They have plans that are basically aimed at giving the interior of their store a facelift,” said Kerr. “They’re going to make some changes to the cashier stations, the dressing rooms and areas throughout the store. Boost Mobile and Adams Hallmark have been the latest additions to the mall and those came after uBurn Sauce Company and Boardwalk Arcade & Confections went in earlier in 2018. In October of last year, the Armed Forces Services Center began a $144,000 renovation. 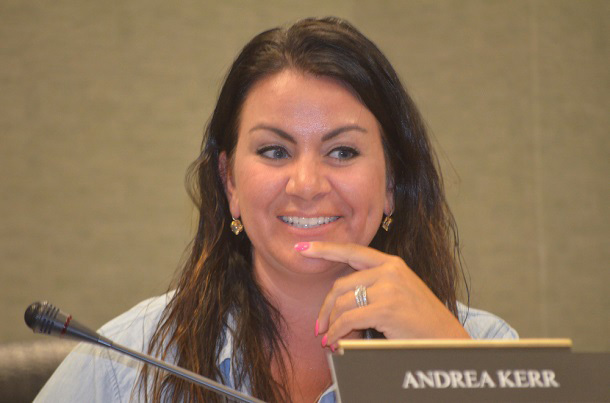 Editor's Note: Community Development Director Andrea Kerr is shown above.